The Kitten, the Witches and the Bad Wardrobe • View topic - Willow/Tara... Lego? The Kitten, the Witches and the Bad Wardrobe • View topic - Willow/Tara... Lego? Based on Useful_Oxymoron's Tinker, tailor, soldier... spaz collection (specifically the second one, The Honourable Scoundrel), Tara's Blue Leader hotrod Y-Wing, with elongated engines, stabiliser fins, and the main engine pylons angled rather than straight (although I cheated a bit based on the parts I had to hand, the new pylons don't actually bring the engines any closer to the fuselage, and they're 45 degrees rather than 50... and I only realised on re-reading that the story never specifies if the new pylons are angled forward or back, I just assumed forward because it seems more agile that way). 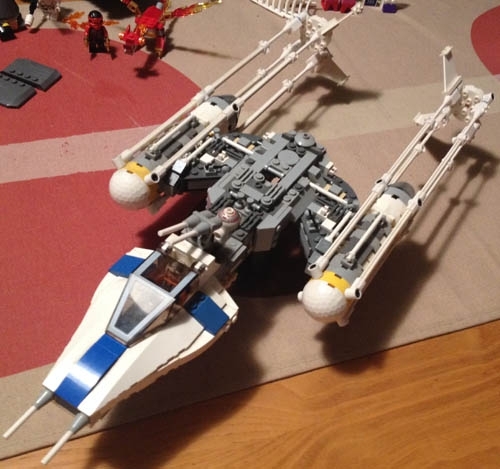 In other respects it's just a standard Lego Y-Wing from a few years back - I got a new Gold Leader one as part of the Rogue One line, so I figured it was time to follow up the idea I'd had from the story back when I first read it and modify this one. Still a few odds and ends to go (which I guess means at least one more post for this thread someday) - I need to go hunting through my spare parts for blue discs to replace the yellow on the engine pods, and I'll be swapping the current droid for one with a transparent head, so it's a proper R3. Might also swap Tara's flight suit and helmet for one of the newer, more detailed ones they did for Rogue One. 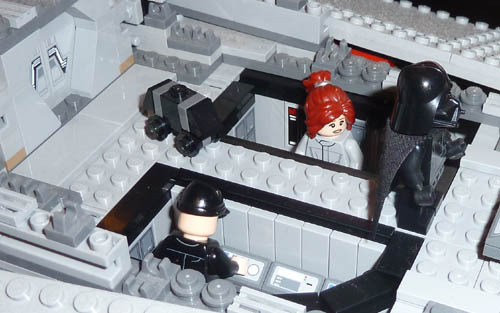 I'm also (naturally) looking at options for a matching Willow minifig, in a rebel tech outfit - might use a spare hair from the new Barbara Gordon for that, it's a bit curlier than I'd at first thought, but Willow's hair wasn't always straight, so it'll work. 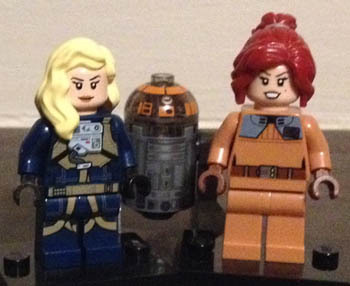 So yeah, Willow/Tara Star Wars Lego, that's now a thing. Last edited by Artemis on Tue Jul 18, 2017 10:28 pm, edited 1 time in total. 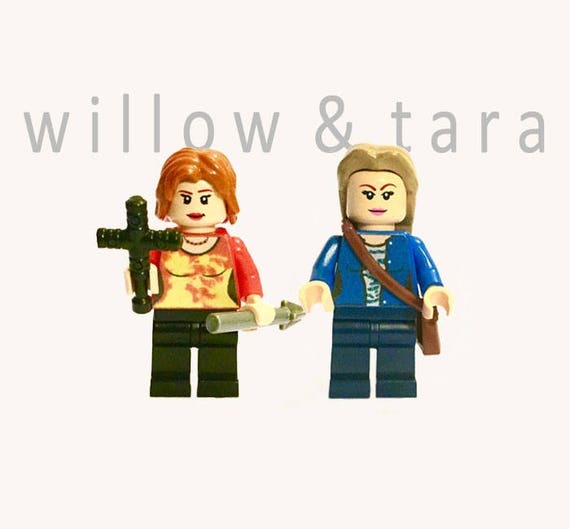 Post subject: Re: Willow/Tara... Lego? I mean this in the least creepiest way possible, but I fangirl over you regularly and this kind of stuff is exactly the reason why. I love making W/T crafty stuff. I've used the various graphic generator things like Peanuts style and Powerpuff Girl style, some W/T cookies, a W/T yule manger, got W/T coke bottles printed up when that promotion was happening but somehow LEGO never occurred to me! Yours is brilliant. Plus you sent me towards that story thread, which I don't think I'd seen before. Looking forward to seeing any additions/amendments! And while I had those minifigs out, I thought I'd redress them to fit into the Willow/Tara Supergirl verse hinted at in one of the TV guide graphics at the end of She-Ra episodes - so this is a Lego set of an uber W/T pair from a tv show that exists in a fictional world in which the She-Ra fics are a real tv show. Getting into Inception kinds of things here. 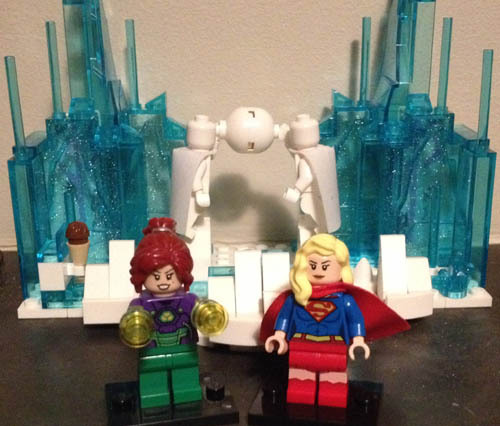 Willow Luthor and Tara Zor-El, in front of the little Fortress of Solitude piece I put together for the regular Supergirl - actually made out of the parts of the first version of Elsa's Ice Palace from Frozen, since a second version came out recently that's larger and better looking. What's going on with Willow's hands is an idea that popped into my head kind of fully-formed for how the season finale for Supergirl could go, with Lillian (I guess Sheila in this version? Let's call her Lillian anyway, 'Sheila' just doesn't have that ring of villainy, especially if you're Australian) using some evil doohickey to turn the sun red, thus depriving Supergirl of powers, and of course it goes out of control and the Earth's going to be destroyed in a supernova, and then Lena/Willow shows up, and it turns out that in earlier episodes when she was looking all suspicious hunting down the Warsuit from Lex's arsenal (I suppose that'd be Xander here, given the similar names), she actually wanted it so she could rework its kryptonite radiation emitters to project intense sunlight, so she can power up Tara, Earth is saved, and there's so much kissing. (Not with Mon-El though, obviously.) The season finale won't be for a couple more months or something, I'm going to stay in my fantasy world until then. I can't even, with how epic this is. Your awesomeness knows no bounds, sir. What a talent - brilliant stuff! ...Willow sneakily steals data for the Rebellion right from under the helmeted nose of the Dark Lord of the Sith himself. Amazing! Thanks a lot for the shared idea! Your story is worthy a read! Chris - these might appeal to you! I plan on getting them soon. Along the same lines, here's my default Willow and Tara - in Lego Yellow because I've got a lot more pieces to choose from (including the midriff-baring top for Tara), and I'm perpetually short of flesh tone minifigs (I mean, I've got heaps, but they're all being whoever they're being, it's actually not that often I end up with a duplicate I can use for spares to make 'new' characters - another reason the above W&T will be good to get, as well as just supporting the Kitten Industrial Complex in general). Got 'em! Posing alongside supervillain Willow and Tara in front of their volcano lair, because yes I am working on that short fic. I just bought them. I don't even play with Lego anymore but I may re-start! Yep, that's how it starts, and then before you know it you're wondering how you can rearrange the shelves to make room for the Bat-Space Shuttle. Posting this here because a) it's just the one image and I didn't want to make a whole new thread just for that, and b) I had Lego Willow and Tara on the table in front of me as a guide while I was building - Minecraft (Lego) Willow and Tara! And MKF, of course (her eyes are actually creeper heads, that works better than I thought from a distance). I tried to represent Tara's crooked smile using a step piece, but I'm not really happy with that, so I may come back to it. They're mostly made of wool, if you're curious. As you can see they're part of my all-purpose Field Of Giants for various characters I'm fond of (and rightly, W&T are in the front row) - besides Zatanna, Power Girl, and Wonder Woman, She-Hulk's behind Willow, you can just see the edge of Samara (from Mass Effect) beside Tara, and Isabella from Dragon Age 2 is off to the right. The railway leads to the ocean to the left (where I walled off and drained the area around an ocean monument, because I wanted to have a good look at the structure but being underwater unnerves me) and to the right, a 1:1 scale Great Pyramid. It's an odd little world. I want the mcwilltara to be the next special item at McDonalds.